Mariposa Dairy in Lindsay, Ontario has created a uniquely decadent, multiple award-winning flavor triumvirate by wedding their handcrafted, creamy goat cheese with specialty dark chocolate and sweet cherry spread. 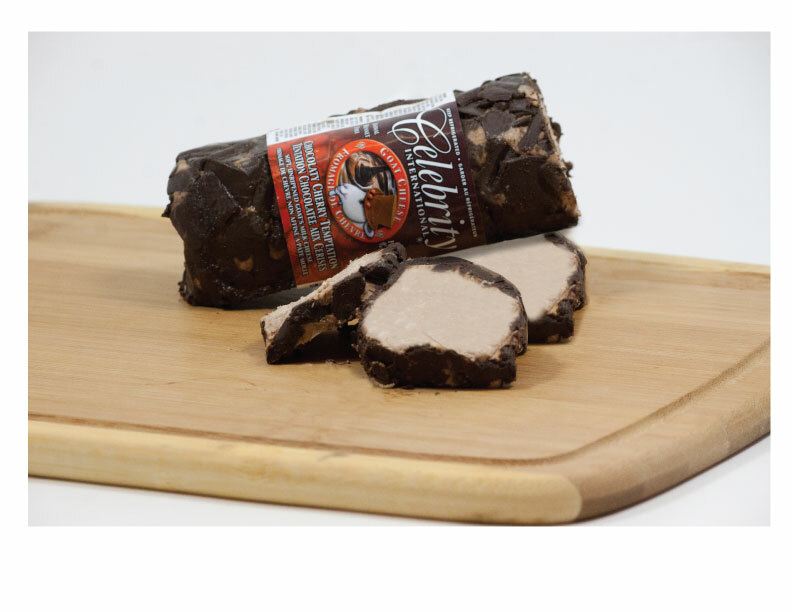 Mariposa starts with 100% Ontario farm-fresh milk for their Celebrity brand Chocolaty Cherry Temptation, then finishes each beautifully indulgent dessert cheese by hand-rolling them in fine dark chocolate shavings and bits of dried cherries. Celebrity goat cheeses are known for their superior quality, as well as for striking a divine balance on the palate when adding any additional ingredients. The three diversely rich flavor profiles brought together so exquisitely and elegantly for Celebrity Chocolaty Cherry Temptation makes this cheese a delightfully sweet addiction. Application: Wonderful for entertaining, or enjoying more intimately, as a sweet appetizer or as a dessert, Chocolaty Cherry Temptation also adds taste and texture to mousse and brownie recipes. Pairing: Try it with a tawny or ruby Port or a Canadian ice wine. Amarena Cherries are the height of culinary sophistication. Direct from Italy’s Vignola mountains, these intensely flavored, wild, deep-red Italian cherries are carefully chosen, pitted, then preserved in a beautiful airtight jar containing a rich, traditional, sweet and slightly tart syrup (made from juice of the same firm, tender cherries). The result is a lusciously intoxicating taste ready to garnish a range of desserts from ice cream, gelato, smoothies and 'semifreddi' (ice-cream cakes) to panna cotta, sponge cake, cannoli and even breakfast pancakes and waffles. Dropping Amarena Cherries in seltzer or Champaign makes a simple, yet luxurious refreshment.